The resolution on the determination of the Day of the Serbian Armed Forces and other military holidays in the Ministry of Defence and the Serbian Armed Forces is issued by the President of the Republic on the proposal of the Minister of Defence. Day of the Army – November 16 – On that day in 1914 one of the most important battles of the First World War started, Battle of Kolubara. The backbone of Serbian Army combat operations during the battle were eleven infantry divisions and one cavalry division, supported with 426 pieces of artillery. Day of the Air Force and Air Defense – December 24 – On that day in 1912, following the Decision by the Serbian Military Ministry and the General Staff, Vojvoda Radomir Putnik signed the Order on the Establishment of the Air Force Command based in Niš. It consisted of the ‘Aeroplane and Balloon’ Department, Hydrogen Station and Pigeon Mail (all elements of the Air Force at that time). Back then, Serbia was one of the 15 countries in the world that had the Air Force and one among the first five countries in the world to deploy aircraft in combat, during the siege of Shkodra in 1913. 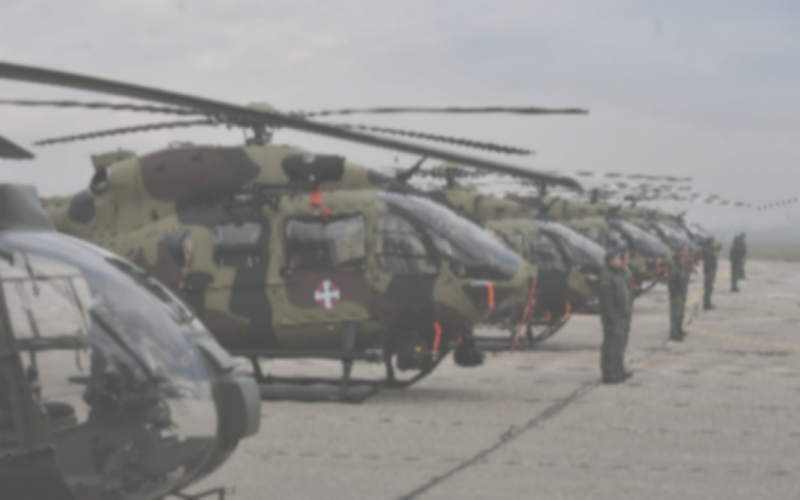 Aviation Day – August 2 – On that day in 1893, Serbian King Aleksandar I Obrenović issued the Order to establish an aviation section in each division, and they were the first air force units in the Serbian Armed Forces. Traditionally, until 1941 the day was celebrated as the Slava (patron saint celebration) of all pilots and airmen. River Units Day – August 6 – On that day in 1915, in Čukarica near Belgrade, the first Serbian river warship Jadar was launched, which is the official beginning of establishing Serbian river flotilla. Artillery Day – September 1 – On that day in 1918, a preparatory artillery bombardment for the Salonika Front breakthrough began, which lasted until the early breakthrough - September 15, at 5:30. Nearly 2,000 artillery pieces sounded the start of the long-awaited attack of the Allied Forces in the Salonika Front. Day of the Air Defence Missile Units – September 30 – On that day in 1915, a group of German aircraft bombed Kragujevac. At that time, gunner Radomir Raka Ljutovac downed the German plane with gun fire. It was the first downing of enemy aircraft using anti-aircraft gun in Serbia. Armored Units Day – October 31 – On that day in 1941, a rebel platoon of two tanks was for the first time deployed during the battle for liberation of Kraljevo. Day of Engineering Branch – November 6 – On that day in 1865, the Principality of Serbia adopted the Act on Amending the Act on Regulation of the Army of 1864, which separated pontoniers and pioneers from Artillery, creating the new branch - Engineering. Day of Electronic Warfare Units – November 11 – On that day in 1946, the first unit for radio reconnaissance and electronic warfare was established in Niš. Infantry Day – November 16 – On that day in 1914, the Kolubara Battle began. The backbone of the Serbian Army operations during the battle were eleven infantry divisions and one cavalry division, supported with 426 artillery pieces. Day of the Military Music Service – January 10 – On January 10, 1845 a military law on theorganization of military garrisons (Ustroenie garnizonog voinstva) defined that a military band comprises 50 people (Kapellmeister, drum major, drummer and 47 plain musicians). Day of Geodetic Survey Service – February 5 – On that day in 1876, Prince Milan Obrenović made the decision to establish the General Staff of the Serbian Army, which consisted of three sections, and the 2nd Section was geographical, with the purpose to survey Serbia for military needs. Day of the IT Service – February 21 – On that day in 1963, the 6th Department was established. The Data Processing Centre was subordinated to the Department. In 1964 the Centre was equipped with the first computer system UNIVAC-1004. Later, the computer centres were the successors of the Centre in terms of both the equipment and the staff. Therefore, that day is associated with the introduction of IT in the military and various working aspects. Day of the Intelligence Service – March 5 – On March 5, 1884 a Statute of the General Staff was adopted, and it envisaged, for the first time in the history of the modern Serbian state, the establishment of an organizational unit solely devoted to the military intelligence work. This Statute also defined the role, organization and scope of work of the Main General Staff which comprised three departments. Operational Department was divided into Foreign Affairs Section and Internal Affairs Section. The Foreign Affairs Section studied European and neighboring countries and their respective armed forces, primarily their organization, manning, composition, number of personnel, deployments, education and structure. Day of Legal Service – May 10 – On that day in 1864, the Military Judiciary Code was adopted in Serbia. It regulated the organization and procedures of military courts in regular and emergency situations. Day of Air Surveillance and Early Warning Service – June 18 – On that day in 1915, the Serbian Supreme Command issued an order to establish permanent observation signal stations, to indicate the flight directions of the enemy aircraft. Accordingly, a large number of stations were established in the former Third Army, covering the areas of Drina Division, Timok Division and Combined Division. Day of Personnel Service – September 1 – On that day, based on the practice of personnel service in the Armed Forces and the experiences of foreign armed forces, the "Personnel Year" begins. Day of the Quartermaster Service – September 14 – On that day in 1885, the Minister of Defense, the General Staff Colonel Jovan Petrović issued the Order on Chief Quartermaster and Administration Service of the General Staff. Day of Military Police – September 14 – On that day in 1955, the Military Police were established in the Yugoslav People’s Army, by the order of the Supreme Commander. Technical Service Day – September 15 – On that day in 1891, the powder magazine Obilićevo in Kruševac started the production of nitrocellulose (smokeless) powder, which by 1901 enabled the Kragujevac Institute to introduce the production of 7x57 mm ammunition for Mauser rifles M-1899. Transport Service Day – September 15 – On that day in 1908, King Peter I Karadjordjević issued the Decree on the Establishment of the Transport Service. Day of the Communication Service – September 20 – On that day in 1916, on the proposal of the Minister of War, Crown Prince Aleksandar Karađorđević approved the Decree on the Military Telegraph. Based on the Decree, the signal units were separated from the Engineering Branch, they developed into battalion-regiment level units, which turned the signal units into a separate Army branch. CBRN Service Day – September 28 – On that day in 1932, by the Decree of the Minister of the Army and Navy of the Kingdom of Yugoslavia, the Powder Battalion was established in Kruševac within the Institute Obilićevo. It was the first regular chemical protection unit. Day of the Military paratroopers – October 14 – On October 14, 1944 the 1st Paratrooper battalion of the Yugoslav People’s Liberation Movement was formed in Gravina near Bari in Italy. This day was celebrated as the Day of the former 63rd Paratrooper Brigade. Day of the Veterinary Service – November 1 – On that day in 1851, at the request of the State Council, the first Chief of the Veterinary Service was appointed by the Decree of Prince Alexander Karađorđević. Day of Meteorological and Navigation Service – November 1 – On that day in 1923, the Meteorological Section of the First Air Force Command was established in Petrovaradin. The Section was in charge of managing the aviation meteorological services and their manning and equipment. Day of the Finance Service – November 8 – On that day in 1944, the Finance Department of the National Defense Commissariat was established, which became the main finance authority for the entire People's Liberation Army. At the same time, elements of the Finance Service were established in all commands. It was the first time that Finance service was established as a separate one in Serbian military. Construction Service Day – November 8 – That is the World Urbanism Day, officially accepted by the Republic of Serbia. The role of urban planning in military construction is evident in defining and adapting the mutual needs of the defense system. This area has special importance in arranging the space inside military bases. Day of the Chaplaincy Service – November 12 – On November 12, 1839 the provision of chaplaincy service in the military was defined for the first time through the adoption of the Military Actof the Principality of Serbia. Day of the Security Service – November 12 – On November 12, 1839 the Military Act was adopted, and it represented the first legal document which comprehensively defined the security and counterintelligence protection of the Principality of Serbia’s military. This Act analyzed indetail the forms of threats to military’s security; it envisaged the actions and sanctions to be taken in case of betrayal, running away, mutiny and other forms of individual or collective actions. The Act also dealt with debauchery and violence, paying special attention to the acts of espionage, as well as acts directed against the Constitution and “people’s freedom”. Day of the Military Veterans – December 4 – On December 4, 1912 the truce in the First Balkan War was signed between the Allies (Kingdom of Serbia, Kingdom of Montenegro, Kingdom of Bulgaria) on one side, and the Ottoman Empire, as a defeated side, on the other. Approximately 400 000 fighters got then the status of an old warrior (contemporary name – veteran) and attendance to their needs was given to the Military Ministry of the Government of the Kingdom of Serbia, for which these people were of vital significance due to their participation in the upcoming wars. Day of the Military Hospital in Niš – January 22 – On that day in 1878, on the Surgeon General's proposal, the Minister of Defense issued the Decree on starting the work of the military hospital in Niš for one thousand sick and wounded personnel. Day of the Odbrana Media Centre – January 24 – on that day in 1879, the first issue of Ratnik military magazine came out of print. The Centre continues that tradition. Day of the 4th Army Brigade – January 31 – It marks the day of the liberation of Vranje from the Turks, and this is also the Day of the First Infantry Regiment of Prince Miloš the Great, stationed at the barracks in Vranje, which still bears his name. This regiment had existed for more than five decades and was involved in five wars. Besides the City Liberation Day, January 31 was the Slava (patron saint celebration) of the town of Vranje (St Athanasius the Great). Those holidays were also celebrated by the members of the First Infantry Regiment of Prince Miloš the Great, because January 31 was also the regimental Slava. Members of the former 78th Brigade, which was incorporated into the 4th Army Brigade used to celebrate it as the Day of the Unit. Day of the Military Geographical Institute – February 5 – On that day in 1876, Prince Milan Obrenović made the decision to form the General Staff of the Serbian Army, which had three departments where the 2nd Department was geographical, with the purpose to survey Serbia for military needs. Day of the Strategic Research Institute – February 5 – On February 5, 1876 Prince Milan Obrenović passed a decree on the organization of the Main General Staff, which envisaged for the General Staff to comprise three Departments, the third of which was the Historical Department. This laid the foundation for the first institutionalized work in the field of military history, and this tradition was later followed by the Military Historical Institute which, together with the Institute for War Skills, became a part of the newly formed Strategic Research Institute. Day of the Military Archive – February 5 – On February 5, 1876 Prince Milan Obrenović passed a decree on the organization of the Main General Staff, which envisaged for the General Staff to comprise three Departments, the third of which was the Historical Department whose task, among other things, was to collect historical data, keep the whole archive and manage General Staff library. This laid the foundation forthe first institutionalized work in the field of military history and archive within Serbian military. Day of the Command and Information Systems and IT Support Centre – February 21 – On February 21, 1963 the 7th Directorate was established. Center for Data Processing was subordinated to this Directorate, and it was equipped with the first computer system UNIVAC-1004 in 1964. Later Computer Centers followed the tradition of the Center for Data Processing both in the technical aspect and organization and personnel. Therefore, this date is associated with the introduction of IT technology into military and other segments of its work. Day of the University of Defence – February 24 – On that day in 2011, the Government of the Republic of Serbia, at the proposal of the Minister of Defence, having obtained all necessary approvals and accreditation of academic education units, adopted the Decision on the Establishment of the University of Defence. Day of the Defence Inspectorate – February 26 – On February 26, 1911 King Peter I Karađorđević established the Main Inspectorate of the whole armed forces, passed a decree on the Main Inspectorate of the whole armed forces on the grounds of the Law on the armed forces organization and the Law on the Military Ministry organization. This decree determined the composition, responsibilities and authorities of the Main Inspectorate, which represented formally and legally grounded inspection of the Serbian military. Day of the Military Medical Academy – March 2 – On that day in 1844, with the consent of the Council of the Principality of Serbia, Prince Aleksandar Karađorđević passed the Act on the Establishment of the Central Army Hospital, which laid the foundations for the Main Military Hospital, the forerunner of today's Military Medical Academy. Military Academy Day – March 18 – On that day in 1850, Prince Aleksandar Karađorđević approved the Project of establishing the Artillery School, which trained officers of all arms of the former Serbian Army. As part of its reorganization in 1880, the Military Academy with junior and senior education levels was established. Day of the Technical Test Centre – March 22 – On that day in 1973, by the Decree of the Federal Secretary for National Defence, Army Technical Test Centre started performing tasks in the field of testing arms and military equipment. Day of the Simulation Training Centre – April 16 – On this day Minister of Defense of the Republic of Serbia passed a decision on the establishment of the Simulation Training Centre. Day of the Applied Mathematics and Electronics Centre – May 5 – On May 5, 1967, upon an order of a State Secretary for National Defense of FRY, highly confidential document no. 168, the Centre for creating cyphers was established. The Centre for Applied Mathematics and Electronics continues the tradition of the abovementioned institution. Since 1976 this day had been celebrated as the Day of the 120th Cryptographic Centre, and then as the Day of the Centre for Applied Mathematics since 1982, and recently as theDay of the Centre for Applied Mathematics and Electronics up to 2007, when this institution celebrated 40 years of its existence and work. Guard Day – May 6 – On that day in 1830, by the Order of Prince Miloš Obrenović, Guardia was established. Day of the Military Printing Office “Belgrade” – May 6 – On May 6, 1898, King Aleksandar I Obrenović, on the grounds of the Law on the armed forces organization and the Law on the Military Ministry organization, passed a decree upon which a military printing office with one supervisor and other accompanying staff (including apprentices) was established within Geographic Department of the Military Ministry. Day of the Military Medical Institutions Centre Belgrade – Jun 9 – On that day in 1922, the Centre was formed in Belgrade. Day of the 126th Early Warning Brigade – June 18 – On that day in 1915, the Serbian Supreme Command issued an order to establish permanent observation signal stations, to indicate the flight directions of enemy aircraft. On the basis of the order, in the former Third Army alone there was a significant number of stations established in the areas of the divisions of Drina, Timok and Combined division. The same day marks the day of the Early Warning Service. Day of the Air Force Institute "Moma Stanojlović" – July 1 – On this day in 1916, by the Order of the Supreme Command, the Aircraft Workshop was established at the airport Mikra near Thessaloniki. This workshop changed locations in the course of its existence, and from January 1 1973, it has been located at the Batajnica Airfield. By the Order of the Secretariat of the Federal National Defence of December 13, 1976, it was named the Air Force Institute Moma Stanojlović. Day of the Directorate for Standardization, Codification and Metrology – July 5 – On July 5, 1863, the Artillery Department of the Principality of Serbia passed the first standard called Administracija sviju zavedenija koji sačinjavaju tehnički organi following Miloš Obrenović’s Law. Day of the 2nd Army Brigade – July 12 – On that day in 1805, Đorđe Petrović Karađorđe, the leader of the First Serbian Uprising, with 6,000 rebels, knezes (local region chieftains) and most prominent Serbian voivodas (military leaders, later the rank in the Serbian Army equivalent to Field Marshal) won the victory over the Turks and liberated former Karanovac, today known as the city of Kraljevo and its surroundings. That date is known as the Battle of Karanovac in history. Complete victory and liberation from the Turkish rule was achieved both with successful command and negotiating skills of Karađorđe. River Flotilla Day – August 6 – On this day in 1915, the first Serbian river warship Jadar was launched in Čukarica, Belgrade, which officially marked the beginning of the development of Serbian River Flotilla. The same date is also the Day of River Units. Day of the Military Museum – August 22 – On August 22, 1878, Military Museum was established upon Prince Miloš Obrenović’s Decree. Day of the Mixed Artillery Brigade – September 14 – On that day in 1918, the artillery preparation of the Salonika Front breakthrough began, which lasted until the early breakthrough – September 15 at 5:30. Nearly 2,000 artillery pieces sounded the start of the long-awaited attack of the allied forces in the Salonika Front. The same date is celebrated as the Artillery Day. Signal Brigade Day – September 20 – On this day in 1916, at the proposal of the Minister of War, Crown Prince Aleksandar Karađorđević approved the Regulation on the Military Telegraph. Signal Brigade continues the tradition of Signal Units of the Supreme Command, that is, the General Staff of the Serbian Army, created after the implementation of this Decree. The same day is celebrated as the Day of the Communications Service. Day of the Technical Overhaul Institute "NH Đurđe Dimitrijević Đura" – September 26 – On that day in 1950, the military workshop was established, as a specialized technical services military institution. The order on the establishment also regulated the internal organization of the workshop. Day of the "Stanislav Binički" Orchestra of the Ministry of Defense – September 26 – On that day in 1899, by the Order of the Defense Minister of the Kingdom of Serbia, the Belgrade's Military Band was established. Stanislav Binički Orchestra continues the tradition of the Band. Special Brigade Day – September 29 – On that day in 2006, the Special Brigade was established following the Order of the Minister of Defence of the Republic of Serbia. Day of the Technical Overhaul Institute "Čačak" – September 30 – On that day in 1925, by the Decree of the State Council of the Kingdom of Serbs, Croats and Slovenes, the Municipality of Čačak irrevocably ceded its property to the Ministry of Army and Navy, for the purpose of building the Engineering and Technical Institute. Day of the 3rd Army Brigade – October 7 – On that day in the First Balkan War, 2nd Infantry Regiment "Prince Mihailo" of the Morava Division I Call went to war. 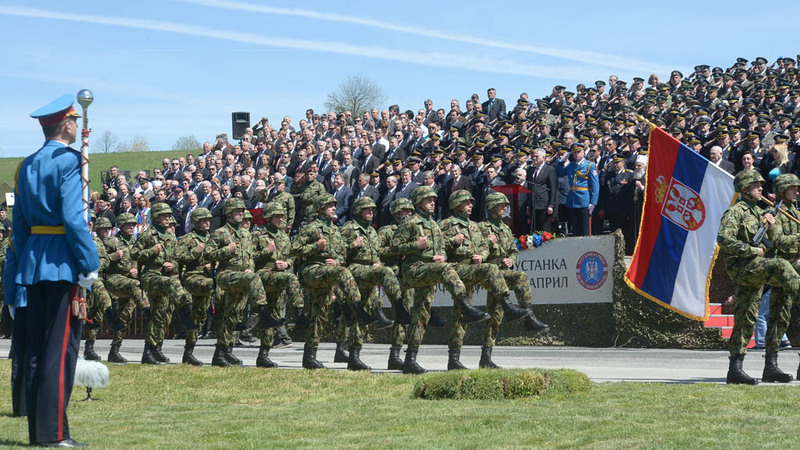 The regiment participated in Kumanovo, Prilep and Bitola battles. During the Second Balkan War, in Bregalnica Battle, due to its fierceness, force and impenetrability of defense, the opponents named it the "Iron Regiment". In the First World War it participated in the Battle of Cer and the composer Stanislav Binički dedicated the piece "March on the Drina" to its third commander, Colonel Milivoje Stojanović. During the withdrawal of the Serbian Army through Albania, the Iron Regiment protected the retreat. In 1916 it participated in the Battle of Gorničevo and in 1918 it was actively involved in the liberation of Niš. The battle way lead the regiment as far as Timisoara. Iron Regiment is one of the most famous units of the Serbian Army, which was used by the Supreme Command in crucial battles. Day of the 3rd Training Centre – October 7 – on that day in 1918, the Serbian Army entered Leskovac. Day of the 2nd Training Centre – October 15 – on that day in 1918, the Serbian Army liberated Valjevo. Day of the Command for Deployment of the Timok Brigade – October 19 – on that day in 1918, Zaječar was liberated. Day of the Command for Deployment of the Rasina Brigade – October 19 – on that day in 1918, the Serbian Army entered Kruševac. Day of the Command for Deployment of the Belgrade Brigade – November 1 – on that day in 1918, the First Serbian Army, under the command of Voivoda Petar Bojović liberated Belgrade. It was the crown of the great Allied offensive that began a month and a half earlier, with the Salonika Front breakthrough. Day of the Military Technical Institute – November 3 – On that day, the Ministry of National Defense of the Federal People’s Republic of Yugoslavia initiated the establishment of the Military Technical Institute. Day of the 1st Brigade of the Army – November 9 – On that day in 1918, a unit of the Serbian Army, led by Major Vojislav Bugarski, entered Novi Sad as the centre of the political movement for secession of Srem, Banat, Bačka and Baranja from Hungary and their unification with Serbia, which happened on November 25 at the Great National Assembly session. Those and other units of the Serbian Army, which gained control of the territory, enabled the implementation of the Assembly elections and the arrival of the deputies for Assembly sessions. Day of the 224th Electronic Warfare Centre – November 11 – On that day in 1946, the first unit for radio reconnaissance and electronic countermeasures was established in Niš. The same day is celebrated as the Day of the Electronic Warfare Units. Day of the Military Medical Centre Novi Sad – November 11 – On that day in 1919, the Head of the Permanent Military Hospital of the Tisa Division was appointed and the establishment – the Petrovaradin Hospital started to operate. Day of the Military Security Agency – November 12 – On that day in 1839, the Act on the Military was adopted, which is the first legal document to comprehensively define the issues of security and counterintelligence protection of the Army of the Principality of Serbia. This Act described in detail the forms of threats to the Army, prescribed the procedures and penalties for treason, desertion, riots and other forms of individual or collective action. Adultery and violence were also covered, especially the espionage as well as crimes against the Constitution and the "freedom of the people." Day of the 1st Training Centre – November 13 – On that day in 1918, the Serbian Army entered Sombor, and on the same day in 2006, by the Order of the Minister of Defence of the Republic of Serbia, the 1st Training Centre was established. Day of the Military Film Centre Zastava Film – November 14 – On that day in 1948, the Deputy Head of the Political Department announced that a new organizational unit was established, the Yugoslav Army Films Department (from memory of the first Head of the Department, Major Marijan Marinac). Day of the Army Training Centre – November 16 – On that day in 1914 Kolubara Battle began. The backbone of the Serbian Army combat operations during the battle were eleven infantry divisions and one cavalry division, supported with 426 pieces of artillery. Day of the Central Logistic Base – November 16 – On that day in 1992, the 608th Logistics Base was established, and the Central Logistic Base continues its tradition. Day of the Peacekeeping Operations Centre – November 17 – On November 17, 1956, an advanced party of the Yugoslav People’s Army unit comprising 44 commanding officers was deployed to United Nations Emergency Force (UNEF) in Sinai, which was established after the end of the Israeli–Arab conflict. Total of 14 200 Yugoslav soldier participated in the said mission from 1956 to 1967. The mandate of these first UN forces was protecting and monitoring the ceasefire, including the withdrawal of French, Israeli and British Armed Forces. After the withdrawal UNEF forces monitored the zone of separation. Day of the 250th Air Defence Missile Brigade – November 24 – On that day in 1962, the brigade was formed. Day of the 98th Air Force Brigade – November 28 – On that day in 1949, the 98th Fighter-Bomber Wing was formed, which has the longest tradition of all the units that today belong to the brigade, as the oldest unit in the former Air Force and Air Defense. Day of the 204th Air Force Brigade – December 2 – On that day in 1949, the 204th Fighter Wing was formed, which has the longest tradition of all the units that belong to the brigade today, and continues the tradition of the famous 6th Fighter Wing, who excelled in the defense of Belgrade in 1941.